Long QT Syndrome - Causes - Mechanism - Symptoms - Treatment. Before Studying QT syndrome, one should have a brief idea of Electrocardiogram (ECG). 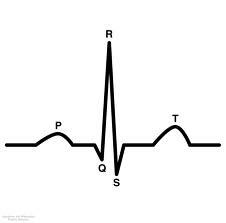 P, Q, R, S and T.
Q, R and S waves are treated as a single unit and is called QRS complex. P wave is formed by contraction of atria. The QRS complex is formed during depolarization and contraction of ventricles. T Wave is formed by the repolarization phase of ventricular action potential conduction. P-R interval, S-T interval, QRS interval and Q-T interval. 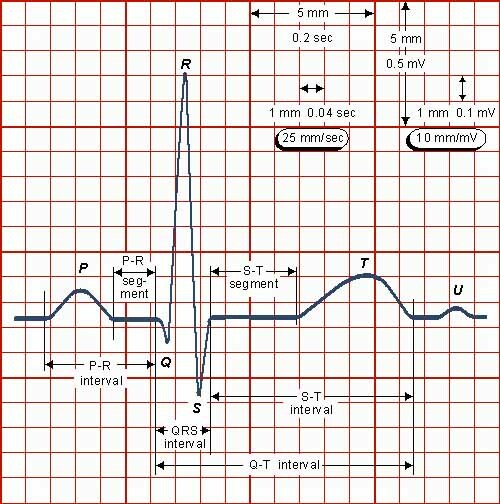 QT interval is the time taken by the ventricle to complete one cycle of the action potential (conduction). In Long QT Syndrome the patient has abnormally longer Q-T interval. That is the conduction of impulse becomes slow down which results in arrhythmias. The longer the Q-T interval slower will be the conduction and lesser will be the ventricular beats. sometimes the patient's heart fails to beat which may result in fainting or death. You can be born with a genetic mutation that puts you at risk of long QT syndrome. In addition, certain medications and medical conditions may cause long QT syndrome. The most common symptom of long QT syndrome (LQTS) is a sudden loss of consciousness, also known as syncope. The condition may also cause seizures and in some instances, cardiac arrest and sudden death. The severity of the condition varies greatly. Some people never experience syncope and others may have frequent episodes that could possibly lead to cardiac arrest and sudden death. or just after physical exertion, emotional excitement or sudden auditory arousal, such as from an alarm clock. It is important to note that with the correct diagnosis and therapy, long QT syndrome (LQTS) is a treatable disorder and most deaths are preventable. Many people with the condition can be treated with medication. A minority of patients will need an implantable cardiac defibrillator. Nutrition consulting guides properly on the eating habits so that one could achieve great health for his/her life. Long QT syndrome (LQTS) results from structural abnormalities in the potassium channels of the heart, which predispose affected persons to an accelerated heart rhythm (arrhythmia). This can lead to sudden loss of consciousness and may cause sudden cardiac death in teenagers and young adults who are faced with stressors ranging from exercise to loud sounds.